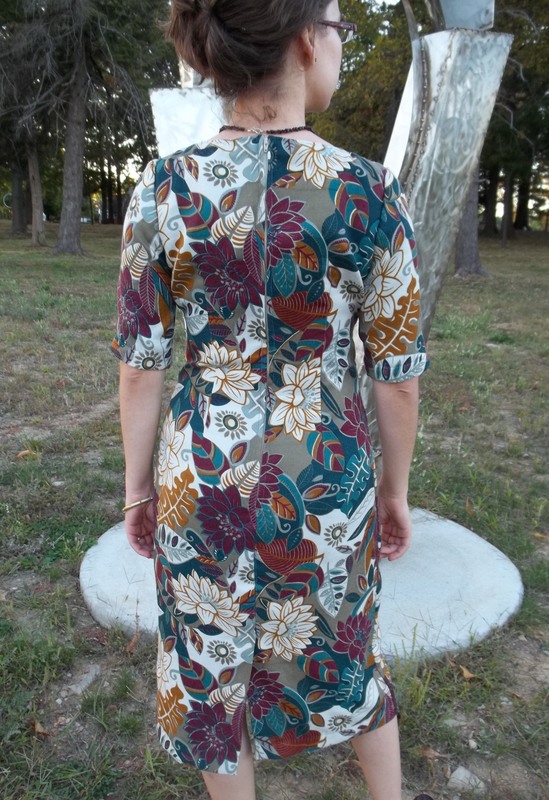 I have owned the New Look #6045 pattern since it came out three years ago, and I have always adored it, waiting for the right circumstances and fabric to come along. This past year’s Fall season provided me with the time and opportunity to finally whip up my fun and versatile version of the pattern. 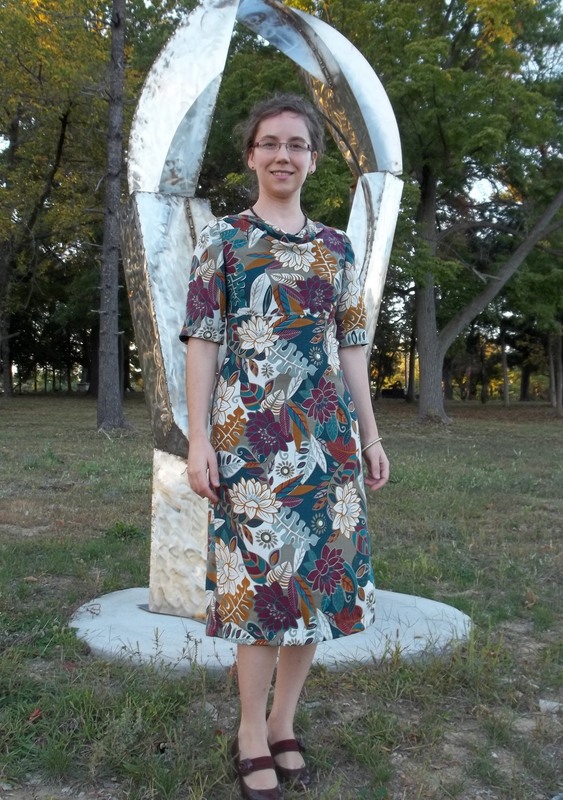 We chose a modern outdoor sculpture in front of The Marianist Art Gallery as the photo shoot location. I enjoy seeing how the modern art brings out the fashion forward vintage appeal which I intended to combine in my draped neck dress. My dress has already seen much wear, and that is always a good sign! The luxurious feel of the fabrics used, the ease of care, and the perfect weight of my dress make this my go to frock when I want to look nice and get dressed up easily during the transition weather of Spring and Fall. I’ll add a nice sweater if it’s chilly out and I’m ready to go! Another big bonus with this dress is all the color matching opportunities…they provide endless possibilities. Every time I wear my dress, I seem to find some more items (shoes, tights, jewelry, sweaters) to co-ordinate together with my dress. Please notice the necklace I’m wearing…I made it myself of sterling silver findings and Garnet gemstone chips. 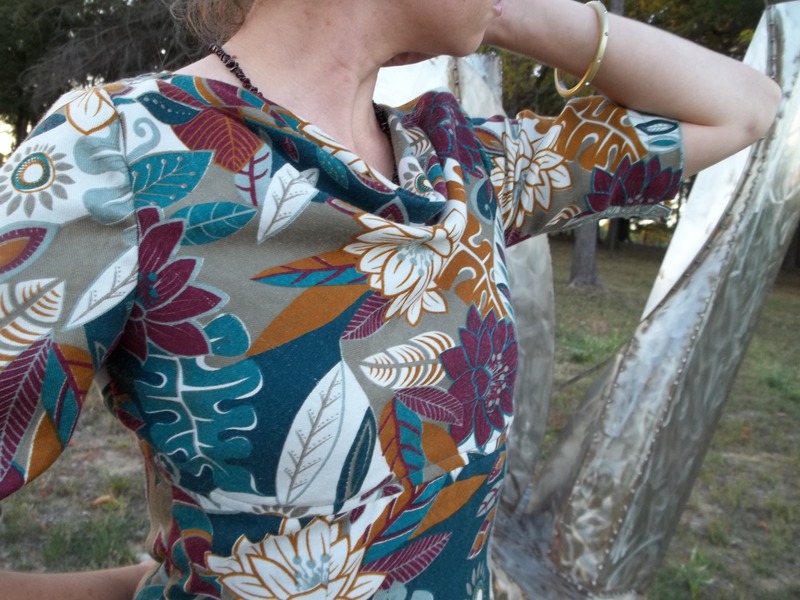 FABRIC: My dress’ fabric is a super-soft brushed 100% polyester, which has the look and feel of being a rayon challis (that tricky imitation poly!). I or my hubby found it in the “Spot the Dot” super clearance section of Hancock Fabrics store. It has a beautiful blend of colors: a mustard golden yellow, peacock turquoise, burgundy red, light aqua, dark brown, and a grey taupe. For the lining, I chose a fine 100% Bemberg rayon, in a dark dusty blue color. The Bemberg rayon was something I happened to find when searching for a matching lining at Hancock, too. 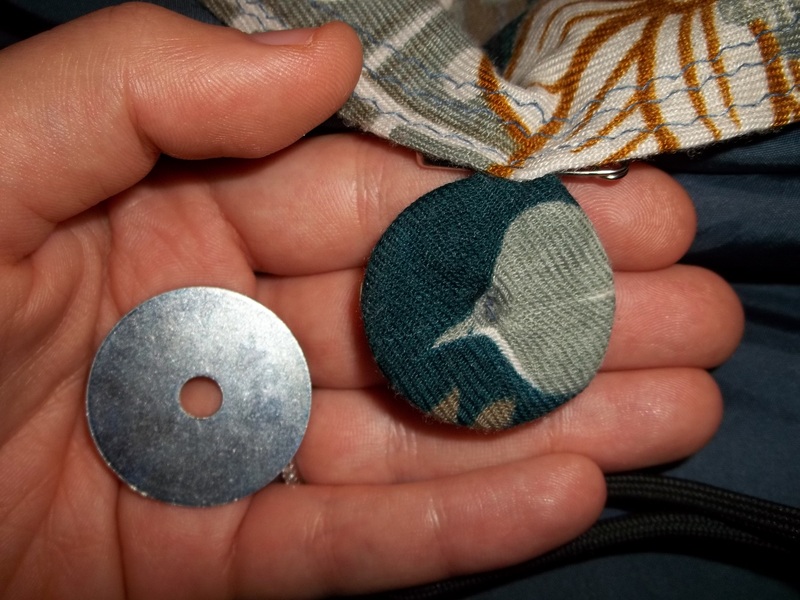 NOTIONS: I needed the normal notion, a long 20-something inch zipper for the center back, but this time I also bought matching thread and a washer from the hardware store (I’ll explain later in my post). I had just enough bias tape on hand, as well. TIME TO COMPLETE: This dress was finished on October 8, 2013, after 10 to 12 hours of work (enjoyment) time. 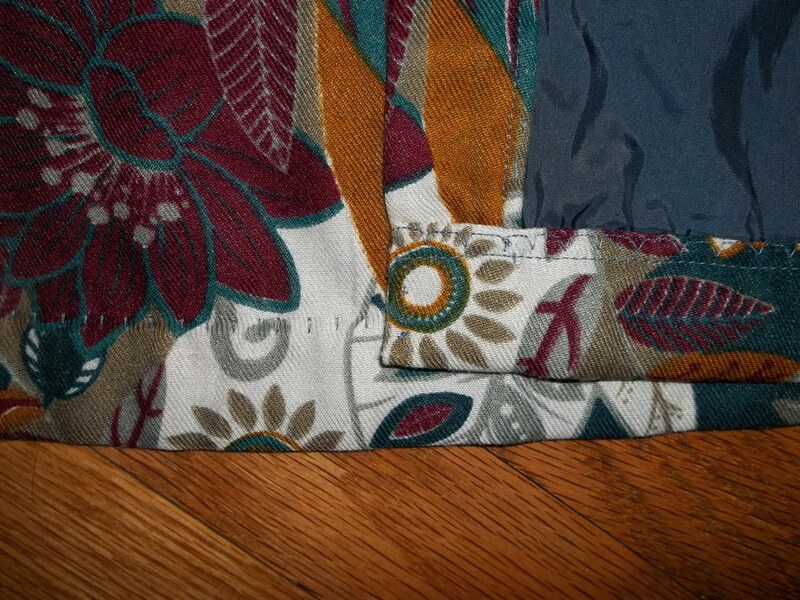 THE INSIDES: Every seam, except the armhole/shoulder seams, are covered in either matching bias tape or nice seams. The armhole/shoulder seam was left raw with only zig zag stitching along the edges, to keep this area pliable and willing to give a little…making it more comfy. I did this same thing to the shoulder /armhole seams of my 1940’s Bow-Neck Satin Dance dress (link here); raw edges, stabilized with some stitching, make for a more comfy seam when I can’t do French seams. TOTAL COST: I really don’t remember any more; I do think the total was under $15. For this pattern, aside from adding length to the hem, I actually did everything as is without any personal touches or changes to the design. Quite unusual for me, but I figured, why mess with a good thing? That was reason number one for making no personal changes.Besides, reason number two was a pretty strong reason as well. My sewing machine, a wonderful Singer older than me, went into “intensive care surgery” at the repair shop right after I started putting my New Look dress together. I really wanted to finish my dress project and not be stuck with no sewing to do (a seamstress’ nightmare!) so used my backup sewing machine. I wasn’t sure of what it was capable of and it seems rather picky, needing a more delicate treatment than what my Singer receives. Thus, having a nice straightforward pattern was perfect for my needs at that time. I made lemonade out of lemons, though, by focusing on what things my backup machine could do differently from my normal machine. I always try to use every sewing project as an opportunity to try and learn something new. The draped neck is no doubt the highlight of this dress – it was my favorite part to sew as well. The upper front bodice pattern has the drape as being one piece with the neckline, so it made for an interesting shaped piece. Looking at many dresses from the 1930’s, when the draped neck styles were a big thing, it seems like the drape has always been the same design: an extension of the neckline so it is a sort of self-facing by falling inside. Some other patterns have a very big drape with an inner cowl facing sewn on as a separate piece. 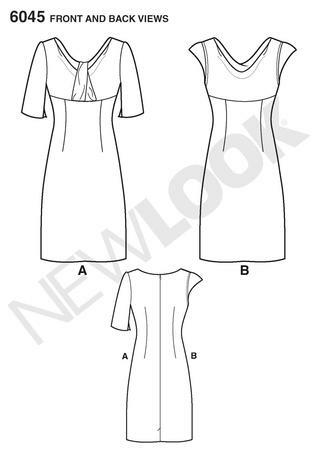 With further research I discovered that there are several different shapes that can create a draped neckline, and there are even a few Threads magazine articles (such as in the January 2014 issue, page 22) which shows you how to transform any pattern into a draped neck design. The pattern of this New Look 6045 dress is designed to involve pleats at the sides (where the shoulder seams are – see picture above) to manipulate the fabric at the neck. This way it does not solely rely on the “true” drape of one solid piece of fabric or a certain bias of the fabric. No matter how the draped look is achieved, regardless, that name still applies. I hope to create more draped neck fashions now that I know how much I enjoyed sewing and wearing such a style. The fit of the sizes given for the dress seem to me to be pretty much right on. You wouldn’t want this dress to be too baggy or roomy at all, anyway, because then the neckline wouldn’t look like a drape as much and the overall effect of the style would not be achieved. The model on the cover of the envelope has her dress with a little more ease than the way my version fits, and I intended on making mine with a bit more extra room. I’m o.k. with how mine fits…it makes it more appealing to my husband…but I can’t eat a very large filling meal when I’m wearing this wiggle-style dress. The sleeves are the one thing that I knew for sure would fit me exactly since I already used them (in a shortened length) on a creation I made a while back, my Green Plaid Cotton Dress. New Look 6045 is one of the rare patterns which doesn’t have restricted reach room or skimpy sizing when it comes to making a sleeve which is actually easy to move in while wearing. The sleeve pattern is actually very nicely roomy and well shaped (I think), especially for someone like me that has thicker upper arms. Has anyone noticed any other additional New Look patterns having roomier sleeves than what “The Big 4” patterns seem to offer? Ah yes, I saved the best for almost last! This dress has on it my first, and so far my only, blind hem. Since I was using my backup machine, it only meant reading the manual and adjusting the dials for me to have access to doing a blind hem. Now that I am sewing on my standby Singer, I get…’lazy’, as I call it…and never feel like dragging out my backup machine and setting it up just for that reason even though I have thought of adding a blind hem to more garments than this one dress. As beautiful as the blind hem turned out at the bottom of my New Look wiggle dress I should get the gumption to do this sewing method again. With this dress, I figured it would be easy (and it was) to try out the blind hem mostly because the bottom hem is not full, thus the length of what I sewed was not over-much. The majority of the work was the measuring and pinning of the hem differently than the normal ways to which I’ve become accustomed. Whoever thought of this type of stitch and hem was a genius – or maybe just an engineer. Either way, I found it so cool how the stitches just disappear discreetly into the fabric when the hem gets pulled into place. I love to add special touches to everything I make. Just a few more details on the dress deserve mentioning. The back zip was done in a different, more conventional, industry-type of style. I usually install my zippers in my very own distinct personal style, which is more tight, sturdy, and invisible. 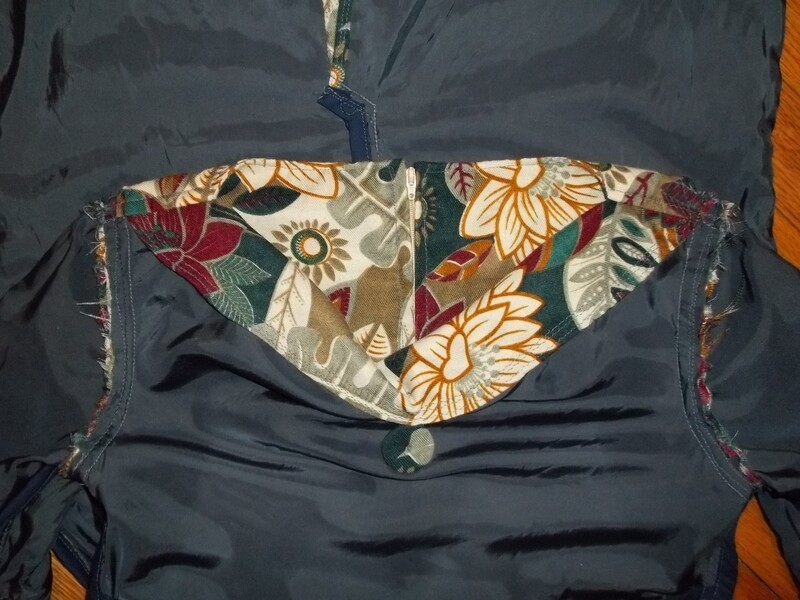 Again, however, as I am sewing with a different machine, I went ahead and used the zipper foot that was available and made the zipper with a large, more open fold just like you see in store bought clothes. 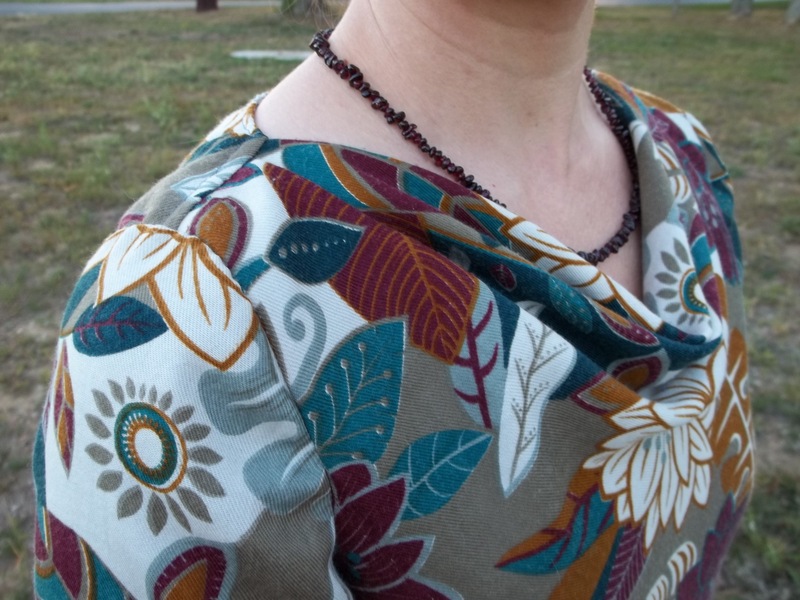 I like the finished look of the zipper placket, and it certainly is different among my creations, but I don’t expect to do a zipper like this again. (I might, but I’m just sayin’…) The bottom hem of the sleeves also have some special, but tiny, detail – a tiny notch at the inside seam point. I don’t see a strong utilitarian need for this tiny vent, and i was slightly miffed at the extra time and trouble it took to finish. Doing those notches did indeed teach me an excellent method for clean finished cuff ends with a slit; I used my knowledge learned to do the sleeve ends of my 1946 Red Wool Suit Dress in a better way. Finally, notice the kick pleat slit at the back. If the pattern hadn’t had this type of slit in the design I probably would’ve added it myself because kick pleat slits are so much more decent while providing no less ease of movement. This dress is hot enough (he, he), I don’t need it to have a racy view all the way up my thighs. My strong suspicion that the New Look pattern had a definite vintage flair was finally verified just a week after I completed my dress. I was so surprised to see an almost exactly designed dress worn on a young girl friend of the handsome Ronnie Burns during a Burns and Allen T.V. show. It can be seen on “The June Wedding” episode, aired on June 16, 1958. Again, as always, the Burns and Allen T.V. Show has given me some inspiring fashion ideas and style validations for the decade of the 50’s. It says something about the dress design for it to be good enough to be worn on screen to one of the top rated T.V. shows of the 50’s, and worn by a pretty and “modern” University of California young woman. Interestingly enough, after some further Google image browsing for 50’s/60’s draped neck dresses, I noticed yet another similar outfit worn by the character of Jane in the T.V. series Mad Men. 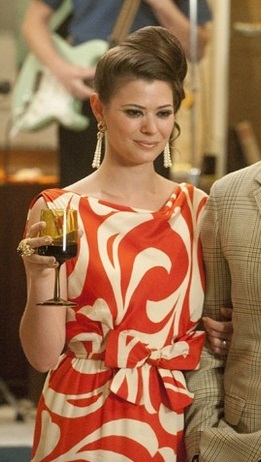 I love how her dress (see picture below) has a similar groovy, swirling type of modern floral as the fabric’s pattern. Her dress, though, has a draped cowl neck going on in the front and the back – so cool! 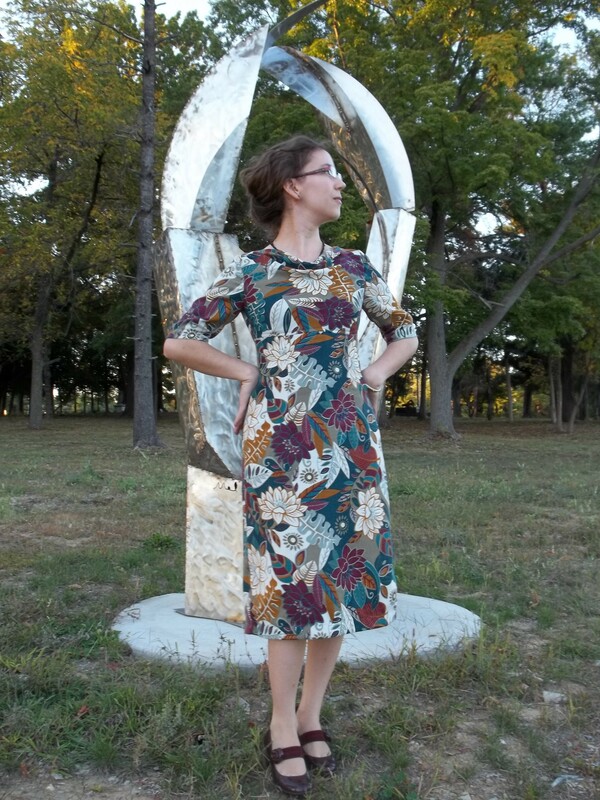 Just prior to this post I found a pattern for sale that also reminded me of my dress, as well as the two other dresses referred to in Mad Men and The Burns and Allen T.V. show. 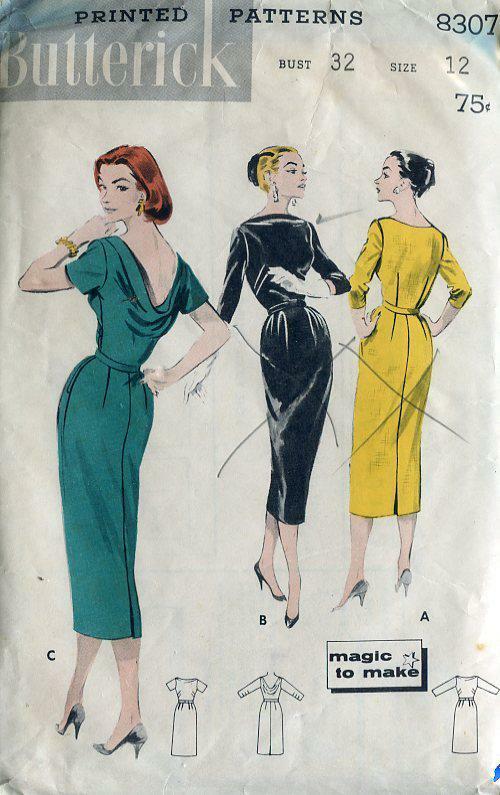 The pattern I saw (the picture at right) is a vintage 1957 Butterick 8307 with a wiggle cocktail shape and a draped cowl neck along the back. (See this pattern’s wiki page here) There are so many more versions of this style of neckline than I had realized before! I wonder how original the dress can be for 2011, as is supposed to be a “Project Runway” creation. Hmmm. Whether or not the design idea was borrowed from sources such as what I’ve pointed out, I love the finished result. I see it as an overlooked vintage style dress that makes me feel so fashionable and good looking, if I must say so myself! Find more hidden vintage-inspired details in modern fashion for yourself and help bring back those classic styles with your own sewing!